I just wanted to let you know that my little boy Gulliver was born at 1:30am on Wednesday morning (19th Feb), weighing 8lb 5oz. It was a very straightforward water birth and though I had contractions for about 24 hours beforehand (the worst bit) he was born within about an hour of getting to the birth centre. I wasn’t quite as calm as Maggie but all the breathing exercises definitely helped and the only other pain relief I needed was a TENS machine for the contractions and gas and air for the birth.. I am happy to say that childbirth was nowhere near as bad as I thought it would be, and the birth centre at the Whittington is fantastic. 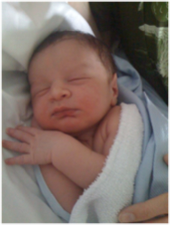 This entry was posted in Uncategorized and tagged First Baby, water birth, Whittington by Ruth. Bookmark the permalink.